Please give an overview of “tissue cytometry” and its relevance in cell analysis. How does it compare to flow cytometry? Flow cytometry has been an established technique used in life science research, and also diagnostics, for more than five decades. If you search PubMed, there are hundreds of thousands of papers which have used flow cytometry as a technique of research and discovery. Over the decades, flow cytometry has evolved to a technique that can quantify molecules on single cells, where today up to 20 or even more markers can be stained simultaneously and real marker profiling can be achieved. The major limitation of flow cytometry is that it is only applicable to cells in suspension, therefore you cannot do a flow cytometric analysis of a solid tissue section. Researchers used to digest tissue blocks in an enzyme solution so that they got a single cell suspension, which could then be analyzed by flow cytometry. One of the major drawbacks of this approach is that you lose any assignment to morphology. You may measure some cells in flow cytometry from a digested tissue block, but you never know where a particular cell came from, for example was it inside or outside a gland, inside the tumor area, close to the tumor area, or away from the tumor area. The second big disadvantage is when you digest living cells in an enzyme solution, a process that takes 12 - 15 hours, the cells will respond to this digestion solution and can start expressing some markers or degrade others. Therefore, measurements after 15 hours of digestion may be different to the original situation in the tissue. As part of my PhD thesis at the Department of Urology University of Vienna, I developed a prototype method on a confocal laser scanning microscope, which allowed the scan of tissue sections stained for multiple markers, followed by an automated analysis on the single cell level. Single cells are recognized typically over a nuclear marker, and then the software measures how much staining is associated with each cell. Staining obviously refers to molecular markers. Several staining combinations mean several markers. And then we can achieve the same thing, a functional and phenotypic characterization of single cells, that flow cytometry does, but this analysis can be performed in a solid tissue section on a slide. Even though flow cytometry can only be used on a small proportion of the human body because we are mainly made up of solid tissue sections, and not liquid, it has a giant place in the market worldwide. Tissue cytometry should actually be considered as a much wider market and not as an extremely small niche or special application. What is the importance of the characterization and understanding of the interactions between cell populations in normal and diseased tissue? Since the successful completion of the human genome project, we know that the human genome contains more than 30,000 genes from which tens of thousands of molecules are derived and build our cells. A human body consists of about 13 billion cells with each cell consisting of thousands of molecules of different species. This requires regulation in order to keep such an abundance of molecules and cells in homeostasis. To achieve this goal, nature has designed regulatory networks that consist of different molecule species which interact with each other. There are so many networks each with many different components and types of molecules that make it up, that no network is completely known and understood today. Researchers are constantly finding new molecules or functions for known molecules. Signal transduction and processing are examples of regulatory networks that take place in what are known as signal transduction cascades. This is subject of intense international research. Whenever a disease occurs, for example an auto immune disorder like diabetes or a form of cancer, this means that somewhere there is an imbalance and the regulatory networks could not properly regulate the tissue, the cell, the organ, and finally homeostasis. It is of critical importance for researchers to understand the difference between normal and diseased tissue, i.e. perform a comparison between normal tissue and different stages of disease, e.g. early/ pre-disease, or late stage of the disease. Understanding signal transduction cascades, and therefore regulatory procedures, on the molecular level implies that it is not enough to look on a single molecule or two because regulatory networks consist of dozens or even hundreds of molecules/markers. Phenotypic characterization, or marker profiling, means measuring multiple markers at the same time and is the prerequisite for understanding the molecular mechanism that leads to a certain disease. And in turn, can lead to developing a specific therapy. This is the basic idea of what is called personalized medicine, or maybe a better word for it would be precision medicine. A therapy made this way is not for a disease like lung cancer in general, but for a certain mechanism which leads to lung cancer. And lung cancer can be caused by different molecular mechanisms, by different genetic defects, by different molecular dysregulations. What we need to understand is the exact mechanism on the molecular level which has lead to lung cancer in that particular patient. With the tools developed by TissueGnostics, multiple markers on single cells, and the interactions between those cells can be determined and quantified on an observer-independent level. Therefore, TissueGnostics doesn't offer anything less than tools for precision medicine. What challenges do researchers face when trying to achieve quantitative assessment of cell populations in histological sections? Flow cytometers analyze suspensions of single cells. Cells have to be resuspended before they can be analyzed. Still, there is always a degree of dublets or multiplets, which are cells sticking together and the flow cytometer cannot properly analyze as single events. They are normally rejected. On top of that, cells in suspension are always whole cells. When analyzing monolayers of cells, normally a homogeneous cell population is used. It means all cells are of the same type, maybe from a single clone, and also the cells in culture are complete. This, however, is very different to a histological section. First of all, a tissue section will always contain a variety of different cells, such as epithelial cells, muscle cells, nerve cells, blood vessels, tissue infiltrating leukocytes and maybe tumor cells at various differentiation stages. And on top of that, the histological section is a 2D slice that represents an actually three-dimensional object. Another big difference between image cytometry and flow cytometry is that cells in suspension tend to be round. However single cells in their native environment, which is the tissue, have various shapes. While finding round shapes in an image is a rather trivial endeavour, which is easy to solve for computers, automated identification of hundreds of different shapes, many of which may occur in the same tissue and even in the same image is a real challenge. A challenge that TissueGnostics meets with its TissueFAXS cytometry platform. Please give an overview of TissueGnostics and how you have paved the way for "tissue cytometry" research. It all started in the 1990's with my Ph.D. thesis. I was trained as a cell biologist and did my masters and Ph.D. at the Department of Urology Medical University of Vienna. One of my first jobs was to manually outline, by using the computer mouse on microscopic images, what is a nucleus and the cytoplasm of each single cell – which had to be done for literally thousands of cells. I did this from early morning to late evening for three weeks until I got tendonitis in my right hand and thought there must be a better way this can be done. This was the starting point of a development which years later led to the foundation of TissueGnostics. This foundation took place in 2003 and in 2005 we founded our subsidiary TissueGnostics Romania, which is our main development branch. In 2007 our subsidiary in Los Angeles, TissueGnostics USA, was set up. In 2008 TissueGnostics was certified for ISO 13485, which is the main quality norm for companies working in the field of medical instrumentations and IVD (in vitro diagnostics). We also started to build up our international network of distribution partners. We always had close collaborations with academia, both nationally and internationally. Over the years we conducted more than a dozen publicly funded collaborative R&D projects together with university partners, which were funded nationally here in Austria. And up to today we had become consortium partner in six big European funded international research projects. Among these are five Marie Curie European training networks. Collaborations with academia are very important because the needs that arise are close to the market needs as well. As I am also trained as a software engineer on C++ and other computer languages, therefore I was able to develop the first prototype of our TissueFAXS cytometry software by myself. TissueGnostics used to be the first supplier of an image cytometry solution that works similarly to flow cytometry with interactive scattergrams that have cut offs and gates. It is now well understood by the experts, technicians and the market that image analysis is a precious tool that can be used to convert images into data. 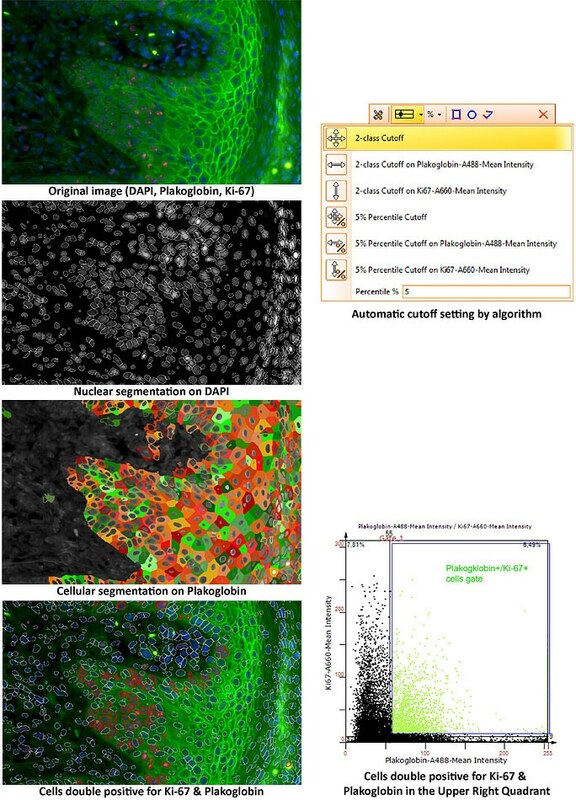 The specific form of image analysis that we are doing is called image cytometry or tissue cytometry, because we are not only measuring the size of a cell or its diameter or its shape, but by quantifying the molecular marker expression per cell our tools allow the user to obtain a functional or phenotypic characterization of single cells. And those single cells are part of a tissue section or cell culture monolayer. TissueGnostics has been a trend setter and helped to prepare the market, generating increased awareness in the scientific community that microscopic images are not just images, that the microscope is not just a very expensive photo camera, but it can be used as an instrument that generates scientific numeric data as well. What imaging solutions do TissueGnostics provide to help researchers clearly identify cell function in tissue samples? Our technology platform is called TissueFAXS. This name has been selected in similarity to the FACS (fluorescence-activated cell sorter), because our technology brings the idea of flow cytometry to the slide, to the tissue section. TissueFAXS consists of high end microscopic imaging hardware. Our software links all the hardware components (microscope, scanning stage, cameras, fluorescence excitation devices, filters, spinning disc, slide loaders etc. ), automates the scanning process (by providing algorithms for tissue detection, finding focus points, finding the focus position, calculation equilibration planes for focus, automated adjustment of settings etc.) and applies a variety of image cytometry algorithms to the virtual slides. The latter – image cytometry – is our core competency and we use a set of algorithms that can identify single cells in tissue sections automatically. There are several approaches, but the main approach is that we take the nucleus as a ‘master channel’ and then measure for each nucleus how much staining is associated with that nucleus inside the nucleus or around the nucleus in each of the color channels. The quantification is therefore done for each single cell, but inside the tissue can be any number of cells, even millions, that are identified and quantified. We offer three major software packages for our clients. TissueQuest, which is the single cell analysis platform for fluorescent samples. HistoQuest, single cell analysis platform for immunohistochemical stains. The high-end software is called StrataQuest; this is our solution for contextual image cytometry. StrataQuest can go beyond the analytical capacity of TissueQuest and HistoQuest, and also have multicellular structures like vessels and glands identified automatically, and then correlate these histological entities with the single cell level. We can offer solutions which automatically identify the tumor area as well as tissue infiltrating/ tumor infiltrating leukocytes. And our software can determine how many leukocytes, e.g. CD4 single- and CD4/FoxP3 double-positive cells are present, inside the tumor or outside the tumor in the stroma. And if they're outside, we can even measure how far are they away from the next tumor structure. Especially for our StrataQuest platform we also offer apps, pre-defined analysis solutions. Upon request, TissueGnostics also offers the development of specific solutions of custom apps as a service. StrataQuest apps come with their own graphical user interface that shows a few control elements necessary to tweak the analysis process, which may change from sample to sample or from staining to staining. Apps are the solution for those users who do not want to develop their own algorithms, who do not want to care about workflow design, but they just want to extract data of a specific staining. But StrataQuest is also a solution for those who want more flexibility to develop their own algorithm and it even offers an interface to link with MATLAB or to C++ libraries, which contain specific code for processing or segmenting images. The name StrataQuest comes from the Latin word stratum, layer, or plural strata, layers, because StrataQuest offers analysis layers. In each layer we can analyze the same sample but under different aspects. For example, in the first layer, we identify the tissue area, in the second layer we identify the tumor, in the third layer we identify all nuclei, in the fourth layer we identify T-helper cells and measure the distance from the tumor area, in the fifth layer we could measure tumor activation markers, and so on. And then you can combine the segmentation results of the different layers; you get to an even more advanced read out. With our software solutions we can address all kinds of user requirements from simple usage on many samples, which is a typical requirement for routine diagnostics, up to highly variable research questions where maybe every day a new question has to be addressed and a new solution has to be developed. How are samples prepared for use in TG systems? Is it a long or difficult process? No, not at all. In fact, there is not even a specific preparation procedure that needs to be followed in order to allow an analysis with our systems. Standard staining protocols, both for immunohistochemistry, as well as immunofluorescent stained samples can be used. Our TissueFAXS scanner records the signal, and our image cytometry solution quantifies it on a single cell level. No special procedure, no special reagents are required. Our TissueFAXS platform can handle paraffin-embedded tissue as well as cryo-cut sections. It can work with cell culture monolayers, in chamber slides, on cover slips, in microwell plates. Our scanners even support oversized slides, e.g. when using big tissue sections. We have inverted systems which can handle slides but also well plates from six well up to 384 wells. All our fluorescent systems can be equipped with a spinning disk confocal device, so we can offer whole slide confocal imaging.The latest member of our TissueFAXS family is an instrument called SPECTRA, which can be used to do multispectral imaging. TissueFAXS SPECTRA allows to increase the number of simultaneously stained markers and still have a clear separation. In SPECTRA we use a liquid crystal tuneable filter that allows for the detection of images within specific wavelength intervals and make multiple images with lightly shifted wavelength intervals. This is a lambda stack, similar to the z-stack in a confocal microscope, which shows the same field of view at different focal positions. The lambda stack is a set of images which show the same field of view in the same focus position, but at different spectral intervals. By the use of mathematics, generally known as spectral unmixing, it can be extracted how much of the total combined signal comes from fluorochrome 1, fluorochrome 2, fluorochrome 3, fluorochrome 4, etc. A particularly useful kind of option is that autofluorescence can be specifically detected and then turned off. Spectral imaging is a very powerful tool to increase the number of markers, and at the same time get a more specific detection and it is important to remove background signals, autofluorescence, which is very often present, especially in the green domain of the spectrum. How does your TissueFAXS software work with your instrumentation to achieve automated scanning profiles? Is it compatible with all TG products? The TissueFAXS suite consists of four applications: the TissueFAXS acquisition and management software, which controls all the hardware components and automates the scanning process, and the other three applications, which I mentioned earlier - TissueQuest, HistoQuest, and StrataQuest. Virtual slides acquired by the TissueFAXS scanners and the TissueFAXS scanning software, are fully compatible with all of our applications. However, with the limitation that the software TissueQuest can only analyze fluorescent samples because it's the software for fluorescent stains, and HistoQuest can only analyze brightfield samples because HistoQuest is for brightfield only. Our image cytometry solutions also support the virtual slides from major third-party slide scanners, hence our analysis applications are also available as standalone solution and can bring substantial added value to existing slide scanner installations. There is also a TissueFAXS Viewer software that can be shared and is available free of charge to everyone. 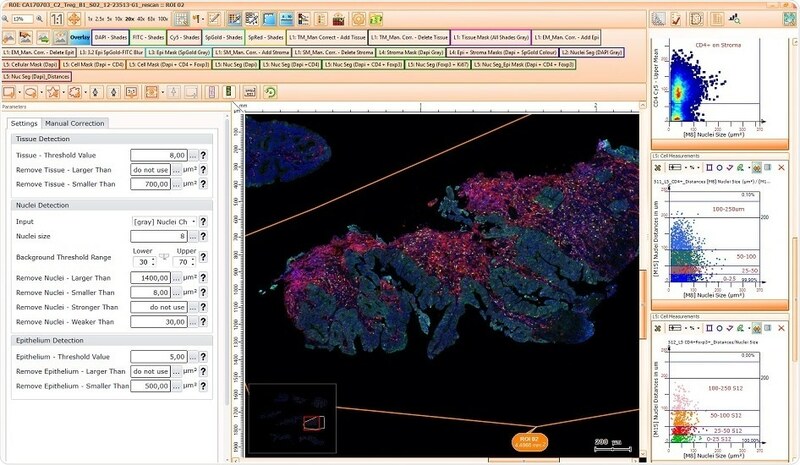 This can be used to open, view, and manage virtual slides scanned by TissueFAXS. Finally, there is a TG Web Viewer application which allows you to upload virtual slides scanned with TissueFAXS directly from the TissueFAXS scanning software to a web server. Everyone, whom an administrator at the research institute or a hospital grants access, can view those virtual slides through a regular web browser worldwide over the internet. In order to ensure reproducibility of both, the scanning and the analysis workflow, TissueFAXS engages Scanning / Automation profiles. While for brightfield samples the settings of the instrument are more or less always the same, there is a high variability in the case of fluorescent scanning. There are many different fluorochromes on the market, the specific detection of which will require adjustments in the excitation, the dynamic range, the filter and the exposure time etc. All the specific settings of the instrument that are required to generate an optimal image can be stored and reused in automation profiles. When a user has a new experiment, a new batch of slides which have been stained with the same protocol to the previous samples, then identical settings for scanning are used in order to generate comparable data. This can be achieved and assured through the use of automation profiles. What do you think the future holds for TissueGnostics’ imaging technology? TissueGnostics will continue and expand its R&D efforts to supply the global scientific community with state-of-the-art solutions for advanced image and tissue cytometry. We do this as part of our international research collaborations, but also based on our internal strategic product development plan. TissueGnostics has started its existence in the role of a trendsetter, and this is also the path that we want to follow into our future. An innovative spirit and continued investment into our R&D is both critically important and characteristic of TissueGnostics. For decades, analyses of immunohistological as well as immunofluorescent samples have been manual, purely visual and often significantly biased. With automation-based workflows for image cytometry of tissue sections and adherent cell cultures on the single-cell level, the products of TissueGnostics support our customers – the research scientists – to fight the reproducibility crisis. With this, TissueGnostics provides state-of-the-art tools and solutions, which help pave the way towards precision medicine. They can visit our website: TissueGnostics.com, our social media sites, we are on Facebook and Twitter, and of course in more than 850 reference papers published by our global user community. Everyone is invited to contact our offices in Austria, Romania, USA, Hong Kong, and Beijing, or any of our distribution partners around the globe, the complete list of which you find on our homepage. Dr Ecker is the a Founding Associate and Chief Executive Officer of TissueGnostics GmbH, Vice President of TissueGnostics USA and Managing Director of TissueGnostics Romania. TissueGnostics is an Austrian company focusing on solutions for precision medicine by offering integrated solutions for high content and/or high throughput scanning and analysis of biomedical, veterinary and natural sciences microscopy samples.